When basketball starts playing Moneyball, this is the book they'll use! Basketball on Paper is a new book by Dean Oliver that combines the statistical analysis of Bill James in baseball with the coaching philosophy of Dean Smith to arrive at a unique tool that is valuable to fans and coaches alike. BUY IT! Though the book is not about the X's and O's of diagramming plays, Dean Smith calls it a "unique and surprisingly practical addition to a coach's library." 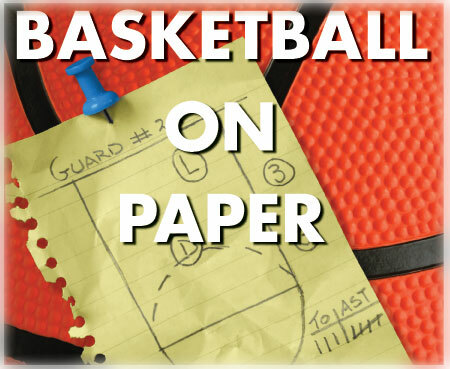 Basketball on Paper illustrates how strategy changes whether you have a good team or a bad team - and how Rick Pitino should have known this before. For fans, Oliver presents some of the greatest players in NBA and WNBA history. How many wins and losses did they create for their teams? Did they make their teammates better? And what about some of the best specialists - how valuable were they? Bill James says, "Excellent writing...Dean is really struggling to understand the actual problem, rather than the statistical after-image of it. I learn a lot by reading him." Come find out more about the book. Buy it through the publisher, at Amazon.com, Barnes & Noble, or at major bookstores.